A reference and sourcebook of work-at-home company listings for freelance editors and writers. 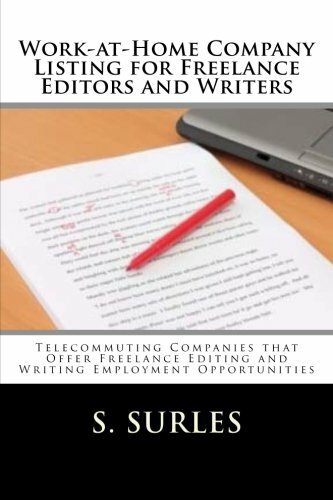 This ebook has compiled a listing of telecommuting companies that previously and currently hire freelance editors, writers and bloggers to work from home. All contact details are provided and verified as of the book’s publication. HEA-Employment.com is a work-at-home job listing service. Our website offers job seekers access to thousands of available work-at-home job opportunities. Over the years we compiled a listing of thousands of legitimate telecommuting companies that hire telecommuters and virtual assistants. The companies listed in this ebook are currently hiring or have hired people to work from home in the past. The companies are accept resumes for current and future job openings. HEA-Employment.com has the most comprehensive work at home job database on the Internet today with access to 1000’s of work at home jobs and home based business opportunities from over 1,000 job boards all on one site. From part-time and temporary to full-time and permanent, every type of job is included. You can select when you want to work, how much you want to work and how much you want to be paid.